offset throws. The weight of the throws tend to make the crankshaft rotate elliptically. This is aggravated further by the weight of the piston and the connecting rod. To eliminate the problem, position the weights along the crankshaft. One weight is placed 180 degrees away from each throw. They are called counterweights and are usually part of the crankshaft but may be a separate bolt on items on small engines. The crankshaft has a tendency to bend slightly when subjected to tremendous thrust from the piston. This deflection of the rotating member causes vibration. This VIBRATION DUE TO DEFLECTION is minimized by heavy crankshaft construction and sufficient support along its length by bearings. occurs when the crankshaft twists because of the power stroke thrusts. It is caused by the cylinders furthest away from the crankshaft output. As these cylinders apply thrust to the crankshaft, it twists and the thrust decreases. The twisting and unwinding of the crankshaft produces a vibration. 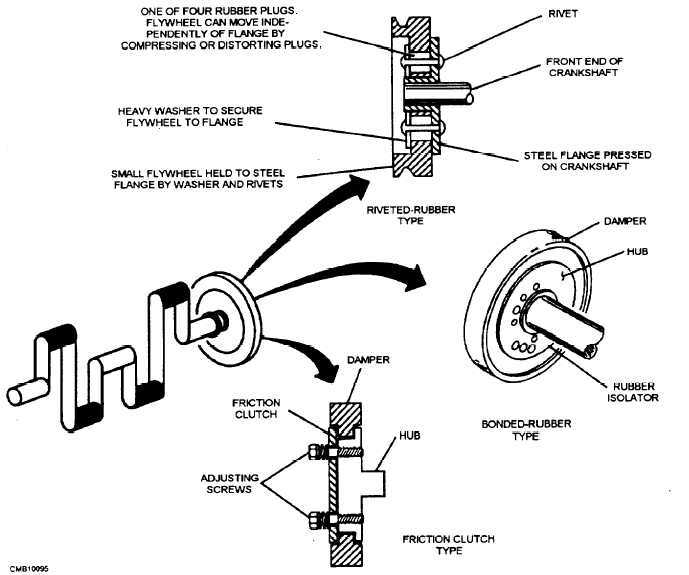 The use of a vibration damper at the end of the crankshaft opposite the output acts to absorb torsional vibration. Figure 3-44. - Vibration damper.